3 – J.S. Johnson Jr. Location: MacEwan University, northwest corner of 105 St. and 104 Ave. Biography: A pupil of pre-eminent British abstract sculptor Anthony Caro, the University of Alberta warmly welcomed Peter Hide to the Faculty of Fine Arts in 1977. Hide became the senior sculpture instructor and influenced at least two generations of Edmonton artists. 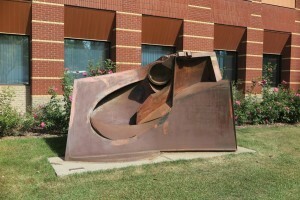 As a result, Edmonton has been one of the most active centres for abstract sculpture since the 1970s.